In the short time between its conception in 1970 and its dissolution in 1999, the Monadic Institute had become an internationally respected institution. This international collective strove to counter destructive audio-visual uses while creating and inventing dynamic approaches to cinema, video, and the emerging visual arts. 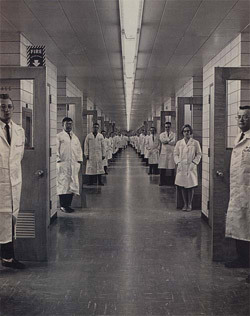 Many of the former Monadic Institute members have since obtained some notoriety. In various countries, former members are injecting their earlier discoveries into mainstream culture. Others continue their involvement in "behind the scenes" forward-thinking research in the science and art of combinatory sound and image. Many of these members are mentioned in the clippings and articles we are presenting in this web site although all their work with the Institute was done anonymously. Our links page provides additional information regarding the kind of work being done by non-members and former members alike. In keeping with the politics and wishes of the Institute, we have focused on their research rather than delving into their specific histories. 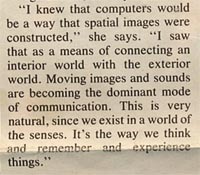 This clipping [fig above] from an article written by a Hong Kong colleague of the Institute clearly acknowledges the multi-dimensional potentials of moving images. Sound and image can indeed create a complex topography for the senses and this framework influences, sometimes heavily, the construction of our reality. The Institute studied the ways that sensory intake affects our reality especially in countries where television consumption is high. A recent Nielsen survey found that the average US citizen watches approximately 4.5 hours per day. This translates into average of 9 years spent watching television during one's life. Our effort with this website is primarily to present a few aspects of this low-profile group and to bring this work to the public in an interesting way. Much of the material might appear on the surface to be more critical than constructive. That said, through even this small sampling we can understand how much power sound and image can have over us psychologically, and physiologically. The Institute worked to transform this perceived power into building a better world through the mediums they believed in. Most serious research into similar domains on such a scale was and is carried out by either the film/television industry for commercial purposes or by what is often referred to as the "military-industrial complex". Both of these "industries" have goals which are self-serving and their end goals could hardly be described as humanistic. The Monadic Institute had no agenda or commercial goal, they considered sound and image 'transmission" as being at the service of humanity. With a youthful playfulness in their experimentation and an intense sentiment of necessity, they advanced in their work as if they were struggling to a cure to a deadly disease. We thank the New York contingent of the Institute for sharing their clipping files with us as well as for permitting us to reprint their articles. As much as possible we have attempted to maintain the spirit of The Monadic Institute. We have selected some elements from their journal Kino-Gun. Other elements which were found in the clipping files seem to have simply been extracted from newspapers or magazines. As much as possible, we attempted to leave them as is in order to better preserve the material trace of their activities. The work of the Institute was intended to be felt far more than it was meant to be seen and heard and so we are now left to make sense of their varied work and interests. Some of the fragments that we have included are as perplexing for us as they may be for those who visit this site but they all provide points of reference. [see fig left] -- This is one of the more playful manifestos of the Monadic Institute as it appears in Kino-Gun #2. It has a slightly exaggerated sense of metaphor to it, reminiscent of Dziga Vertov's writings. However, this should in no way affect our understanding of the seriousness of the work that the contributors performed and that some are still performing. The Monadic Institute also organized and participated in screenings such as this one [fig right] in 1996 with the WPA/Corcoran in Washington DC featuring Guy Debord's whirlwind of reappropriation The Society of the Spectacle which is accompanied by a voiceover heavily inspired by, and at times directly quoting, Lucaks and Marx.